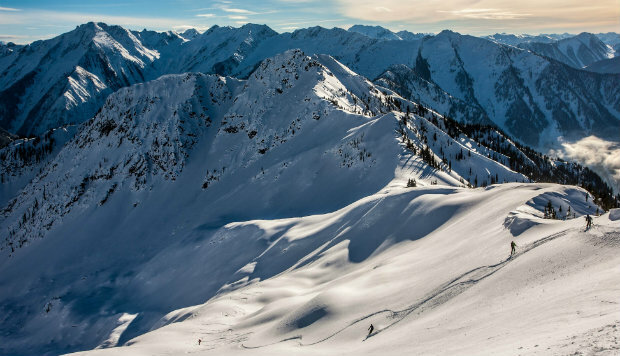 When is the best time to go heli skiing? Snow tends to start falling in October, so by December there is a solid base with plenty of fresh snow. December is a great month for powder skiing in the trees (click to see video). Visibility can be limited with stormy conditions, but our heli pilots can almost always access tree skiing at lower elevations. More fresh snow and intermittent storms mean the pow gets deep! Thigh high powder snow is not uncommon, especially in the trees where it is protected from the wind. The base is deep now, making for fun terrain features like powder pillows and small cliff jumps. Stormy conditions die down, but there is regular snowfall to keep conditions fresh. Towards the end of the month clearer skies and stable conditions mean we can access the high altitude terrain. Ski huge vertical starting on glaciers and alpine powder bowls and finishing in the trees at lower elevation. March brings spring-like conditions with longer days, more sunshine and boot top to knee deep powder. Enjoy the spectacular high altitude skiing, plus the chance to enjoy blue skies and amazing scenery. The snow is still great at high elevations, with superb corn snow on lower sections. This season there has been 66cm of fresh snow in the last 7 days! With Easter falling late next year, Bighorn will be open for spring skiing until April 26th. Who doesn’t like skiing under a bluebird sky? The spectacular Selkirk and Monashee Mountains provide a stunning wilderness backdrop to your heli ski experience and they are best viewed in blazing sunshine. Catch a few rays when you take a break for a gourmet picnic lunch and don’t forget your camera. The snow storms that deliver dumps of snow in December and January are less frequent as the season progresses meaning skies tend to be clearer. Improved visibility allows heliskiers to access the high alpine terrain that is sometimes impossible for the heli to land in during midwinter. Discover high alpine powder bowls and glaciers – flattering skiing with incredible scenery in the background. You’ll feel on top of the world. Maximise your heli ski experience with longer day light hours. This not only allows you more vertical per day and a more flexible schedule, but also means you can enjoy sunset with a beer in hand from the Bighorn hot tub! The Selkirk Mountains receive an average of 40-60ft of snow each season, meaning they are snow-sure until mid April. Warmer conditions in spring mean the snow is continuously frozen and thawed which makes it form large crystals called corn snow. These snowy granules make for smooth, soft and fast skiing – great fun for flying down a wilderness glacier on. Revelstoke’s extensive forests make for the best tree skiing in the world. In the spring the trees provide shade from the sun, preserving the snow late into the season. The beauty of heli skiing is that your expert guides can take you to the best spots in their 500,000 acre terrain. This is never truer than with a private heliski charter from Bighorn, when you have exclusive use of the helicopter and your guide. So if you want to avoid south facing slopes, stay high or stick to the shady trees, the bespoke experience is designed to meet your needs.